California took more employment and innovation bruises this month with two announcements from companies producing the state's favorite products - web technology and solar power. "The social media powerhouse confirmed Thursday that it has picked the economically depressed Central Oregon town for Facebook's first company-owned data center, drawn to the region by reliable and affordable power, a favorable climate and tax breaks." "A Silicon Valley-based company that makes low-cost, high-efficiency solar modules is planning a manufacturing plant in metro Atlanta that could employ up to 1,000. While California remains a hub for solar startups, Oregon, Texas, Colorado and Arizona are becoming destinations as solar firms chase skilled labor and low operating costs, said Terry Peterson, a San Carlos, Calif.-based solar power consultant. While Georgia’s cheap fossil-fueled electricity lowers manufacturing costs, it squelches local demand for solar power." These announcements bring more pain to the state's economy and workers after California lost another 5,900 manufacturing jobs in December, bringing the total since 2001 to more than 607,000. During the first eight years of this decade, California has done an absolutely marvelous job of creating growth in government. According to the Employment Development Department (EDD), there are 184,500 (8%) more employees on the government payroll than on January 1, 2001. Over those same eight years, private sector employment is up only 33,600 (0.2%). This means that the public sector accounts for 85 percent of the overall growth in California over the last eight years. If you look at the chart below, it's obvious, given our state's trend, that the revenue "generators" can’t support the revenue "users" and a swelling government. I sometimes feel like Roy Scheider in "Jaws" after seeing the shark for the first time. Remember that? Captain: "Well, what do you think?" Roy Scheider: "I think we’re going to need a bigger boat." In this case, the boat we need is a thriving private sector with a growing economy, and we need it now. California cannot sustain the nation's largest and most costly state government without a vigorous private sector. As astonishing as the aforementioned numbers might seem, they are only part of the story. 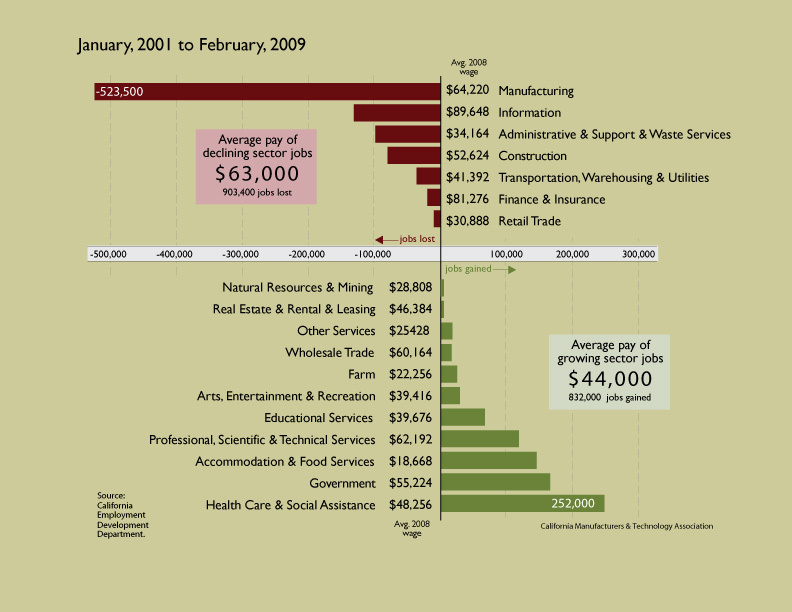 EDD provides data that allows CMTA to track total employment and wages by 19 specific industry sectors. For example, the average wage in the manufacturing sector is $64,220 per year while the average wage in the health care & social assistance sector is $48,256. The manufacturing sector has seen an inordinate decline of 473,500 lost jobs while the health care & social assistance sector has seen the largest increase in jobs, with government running a close second. Overall, the declining job sectors have seen a loss of 730,000 jobs with an average annual wage of $69,000, while the job growth sectors account for 948,000 new jobs with an annual wage of only $45,500. Who could possibly be happy with these results or argue that these numbers are good for California’s workers? As Governor Schwarzenegger and the legislative leadership continue their negotiations to close California’s gaping $42 billion budget hole with a combination of tax increases and spending reductions, it might be a good time to consider a strong dose of economic stimulus targeted at private sector job creation with a nod toward the high wage sectors. Last week, the California Manufacturers & Technology Association, along with 17 other business associations, released a package of stimulus proposals that will begin the arduous task of growing private sector jobs. We want to build a bigger economic boat to address the dangers that have been circling California's economy and working families for eight years.